While people often call lobsters the “cockroaches of the sea,” lobsters are not very closely related to cockroaches. While both are invertebrates with very distant common ancestors, they have evolved in different ways over millions of years. Despite occupying distant branches from each other on the tree of life, cockroaches and lobsters do share similar diets, segmented bodies, hard exoskeletons and nocturnal activity patterns. Cockroaches (Blattidae) are terrestrial insects with six legs, two antennae, three body parts and one pair of wings, while lobsters (Nephropidae) are aquatic crustaceans that have 10 legs, two anntenules, 21 body segments and no wings. Roaches breathe through a tracheal system like most insects, while lobsters absorb oxygen from the water or air through 20 pairs of gills. Cockroaches are usually short-lived animals, though exceptional individuals may live for two or three years. By contrast, lobsters are long-lived creatures that may reach 50 years of age or more in the wild. Lobster claws are highly specialized legs that they use for defense and food acquisition, while the cockroach's legs essentially serve only a locomotor purpose. Both cockroaches and lobsters are omnivorous, consuming a wide variety of food. Lobsters scavenge decaying organic matter from the sea floor, consume algae and eelgrass and hunt for prey such as clams, crabs, snails and small fish. While the lobsters’ diet is diverse, the cockroaches’ diet is even more so. Cockroaches will eat virtually any organic material, including insect corpses, human food, paper and glue. While Arthropoda literally means “joint-legged,” animals in the phylum exhibit segmentation throughout their entire bodies. This segmentation occurs at multiple scales -- just as the bulk of a cockroach’s body is broken into three primary body parts, the animal’s antennae and legs are segmented as well. Lobsters have incredibly segmented bodies that consist of 21 different segments, in addition to their highly segmented legs. Like all other arthropods, both cockroaches and lobsters have hard exoskeletons, which provide them with protection and structural support for their bodies. The exoskeleton is composed of chitin -- a substance somewhat similar to the keratin that produces human hair and fingernails. Both lobsters and immature cockroaches replace their exoskeletons periodically in a process known as molting. In some cases, the animals will consume their old exoskeletons. Lobsters and cockroaches have a wide variety of predators that hunt them. To help avoid predators, both species are primarily active at night. 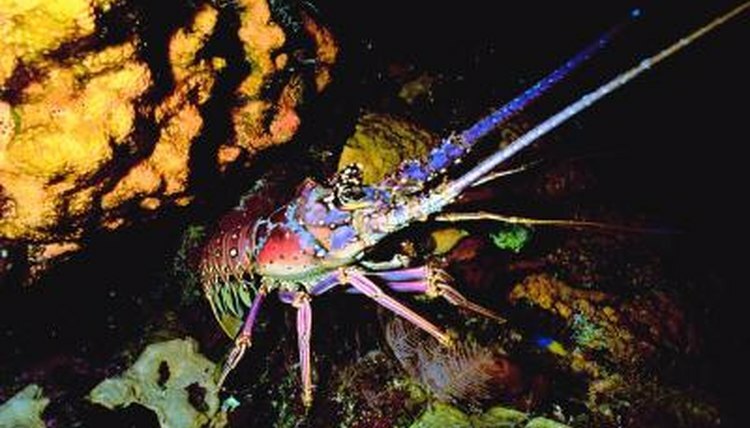 Lobsters will spend their days hiding under rocks or inside reefs, while cockroaches hide under rocks or bark or in other secluded spots.